There’s certain merit to what he says. If you want to save Social Security and you don’t want to raise taxes – I explain why not here and here – then cutting/“slashing” benefits is tough to avoid. But if you read my recent National Affairs article, which I hope Drum will do, it outlines some of the problems with Social Security that go well beyond solvency. Social Security is not a program that’s perfectly fine with the exception of being a couple trillion dollars short of cash. It’s a program that discourages saving, labor force participation, delayed retirement, and even fertility, all of which are important to its own future financing health, not to mention the overall economy. Likewise, as I discuss here, Social Security offers a very leaky safety net. Due to the complexity of the benefit formula, some low earners do very well from the program but a lot of others don’t. While Social Security is progressive on average, it isn't consistently so. Think of it as a social insurance policy that may or may not pay off if you need it. My proposal, which combines a flat poverty-level benefit for all retirees with a supplementary pension savings account, improves in all these areas. It would do less to discourage work and saving, eliminate the payroll tax on older workers to encourage delayed retirement, and cut taxes on parents to avoid penalties for larger families. Moreover, unlike current proposals to cut COLAs, my plan would pay a COLA 1 percentage point above the rate of inflation, to raise benefits for older retirees who are at greater risk of poverty. Yes, it cuts benefits over a period of decades, but it also would boost the economy and take the poverty rate for seniors from around 9 percent to around zero percent. The point isn’t just to make a Social Security program that’s solvent. It’s to make a Social Security program that really works. In a podcast recorded for AEI’s Ricochet series, I discuss my recent National Affairs article on how to fix Social Security – not just to make it solvent, but to make it truly effective for those who need it the most. You can check it out here. 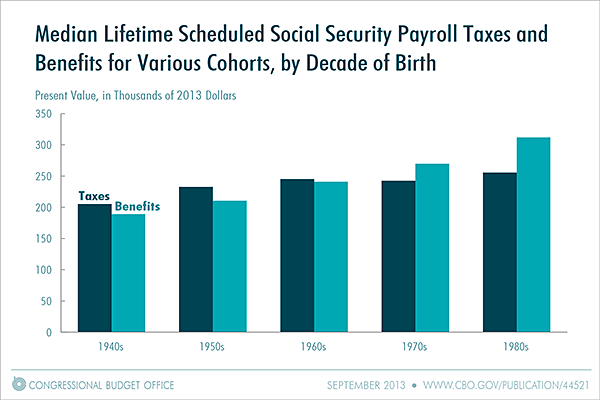 CBO has an interesting report on the lifetime social security and Medicare taxes Americans pay and the benefits they can expect to receive, and how these “money’s worth” factors have changed over time. You can check out the report here. 1.5% Social Security COLA. Should it be more or less? The Social Security Administration today announced that it will pay a Cost of Living Adjustment of 1.5 percent to benefits beginning in January. You don’t have to look far in the next few days to find comments that this COLA is too low, that, as the AARP states, “it will quickly be consumed by the rising costs of basic needs like food, utilities and health care.” In particular, many argue that COLAs, which are calculated based on changes in the prices of goods purchased by the general population, don’t reflect rising prices for goods particularly used by seniors, such as health care. Many argue for basing COLAs on the experimental CPI-E, which tracks prices based on the buying habits of the over-65 population. On the other hand, most economists – and, it seems, the Obama administration – believe that current COLAs overstate inflation. They favor using the so-called “chained CPI” that accounts for how purchasing habits change in response to changing prices. This will usually produce lower inflation and, thus, a lower COLA. There are better alternatives. For one, a chain-weighted version of the CPI-E, which accounts both for the buying habits of the elderly as well as how their purchases change when prices change. Alternately, I’ve proposed a COLA that deliberately raises benefits by more than the rate of inflation, coupled with a lower initial benefit to keep total costs constant. A higher COLA would reduce poverty in truly old age, where it’s most prevalent, and the lower initial benefit would encourage near-retirees to work a little longer. So the issue isn't simply technical; it’s a policy question about what you want Social Security to do. See my recent piece in the Wall Street Journal that looks at AARP’s claims that Social Security benefits are a multi-trillion dollar stimulus to the economy. Maybe so, but you need to think about Social Security taxes as well. Once you do, the net effect isn’t trillions in GDP or millions of jobs, it’s basically about zero. Theoretical models constructed in this paper predict that the on-budget surplus decreases, by an amount less than dollar-for-dollar, in response to an increase in the trust fund surplus. While consistent with the estimates based on cross-sectional data, the prediction is at odds with the estimates based on time series data. The paper then extends the existing time series analyses by introducing a length-of-lag dimension in differencing. By choosing alternative lengths of lag in differencing or not differencing at all, we not only are able to reproduce the range of existing time series estimates, but also generate estimates that are in line with the theoretical prediction. Using variables differenced with the three-year lag, we find that a one-dollar increase in the trust fund surplus causes the on-budget surplus to decrease by an amount of $0.62 - $0.79. Click 1308 to view the paper in pdf format. Read more! The Economist reports on the rising tide of Disability Insurance applications and how it interacts with the U.S. labor market. In theory, disability and unemployment should not be correlated—and from 1966 to 1985 they were not, according to a new study prepared for the Brookings Papers on Economic Activity by Olivier Coibion and two others. But in 1984 DI eligibility criteria were eased so that applicants could qualify based on a combination of conditions rather than just one. Since then, highly subjective conditions such as back pain and mental illnesses have grown to account for most DI beneficiaries, and claims have become more correlated with unemployment . That strongly suggests that many workers find a way to qualify for DI when other benefits have been exhausted. Between 2007 and 2012 the number of applicants for DI shot up from 11.2 per 1,000 working-age people to 14. Unpublished research by Mary Daly of the San Francisco Fed, Richard Burkhauser of Cornell University and Brian Lucking, a graduate student, estimates that this rise in applications equates to 2.6m people. Depending on how many of those applicants are eventually awarded benefits, this could explain between 31% and 59% of the decline in participation among 16-to-64-year-olds. These results suggest that if it were not for people receiving disability insurance, reported unemployment would be far higher. Although DI recipients may initially have climbed because the economy was weak, their numbers will almost certainly not decline when it strengthens again; only 4% of beneficiaries return to work within ten years. The proportion of working-age adults on DI has risen from 1.3% in 1970 to 4.6% in 2013. The impact on participation rates may be cyclical at first and then become structural. "Pensions and Fertility: Back to the Roots - The Introduction of Bismarck's Pension Scheme and the European Fertility Decline"
Fertility has long been declining in industrialised countries and the existence of public pension systems is considered as one of the causes. This paper is the first to provide detailed evidence based on historical data on the mechanism by which a public pension system depresses fertility. Our theoretical framework highlights that the effect of a public pension system on fertility works via the impact of contributions in such a system on disposable income as well as via the impact on future disposable income that is related to the internal rate of return of the pension system. Drawing on a unique historical data set which allows us to measure these variables a jurisdictional level for a time when comprehensive social security was introduced, we estimate the effects predicted by the model. We find that beyond a general depressing effect of social security on birth, a lower internal rate of return of the pension system is associated with a higher birth rate and a higher contribution rate is associated with a lower birth rate. "Reducing Retirement Risk with a Rising Equity Glide-Path"
This study explores the issue of what is an appropriate default equity glide-path for client portfolios during the retirement phase of the life cycle. We find, surprisingly, that rising equity glide-paths in retirement – where the portfolio starts out conservative and becomes more aggressive through the retirement time horizon – have the potential to actually reduce both the probability of failure and the magnitude of failure for client portfolios. This result may appear counter-intuitive from the traditional perspective, which is that equity exposure should decrease throughout retirement as the retiree’s time horizon (and life expectancy) shrinks and mortality looms. Yet the conclusion is actually entirely logical when viewed from the perspective of what scenarios cause a client’s retirement to “fail” in the first place. In scenarios that threaten retirement sustainability – e.g., an extended period of poor returns in the first half of retirement – a declining equity exposure over time will lead the retiree to have the least in stocks if/when the good returns finally show up in the second half of retirement (assuming the entire retirement period does not experience continuing poor returns). With a rising equity glide-path, the retiree is less exposed to losses when most vulnerable in early retirement and the equity exposure is greater by the time subsequent good returns finally show up. In turn, this helps to sustain greater retirement income over the entire time period. Conversely, using a rising equity glide-path in scenarios where equity returns are good early on, the retiree is so far ahead that their subsequent asset allocation choices do not impact the chances to achieve the original retirement goal. "Public Sector Pensions: Options for Reform from the Saskatchewan NDP"
GORDON B. LANG, Gordon B. Lang & Associates Inc. In 2011, just over six million Canadians were enrolled in some type of registered pension plan (RPP). In the public sector, 87.1% of employees were covered by an RPP — up from 75.5% in 1978. In the private sector, just 24.4% of employees were enrolled in an RPP in 2011, down from 35.2% in 1978. In 1974, of those enrolled in a registered pension plan, 98.8% of public sector workers were in a defined benefit plan, which had decreased 94.0% by 2011. In the private sector, 88.0% of private sector workers were in a defined benefit plan in 1974 but that declined to 52.3% by 2011. In the private sector, significant growth has occurred in defined contribution and “other” registered plans. Actuarial assumptions about major provincial public sector pension plans have been too optimistic, which has had consequences for public treasuries. In fact, increased contribution rates and/or bailouts for public sector pension plans have been the norm among the major plans, not the exception. Since the year 2000, taxpayers have seen repeated increases in the contribution rates to public sector pension plans, this to ameliorate pension fund shortfalls. In addition, taxpayers have also been required to bail out the public sector pension plans through special payments. Given the tight connection between the cost of public sector pension plans and the public treasury — and thus to taxpayers, one notable Canadian-made option for reform comes from Saskatchewan. There, the province stopped adding to pension liabilities and did so over three decades ago. The NDP’s 1970s-era reforms can serve as a useful model for long-term reform to any government, provincial or federal. "Lightening of Citizenship and Its Implication for Social Policy: 'Social Security Lite' in the Making?" 'Citizenship' has frequently been used as a key concept in Migration Studies. It has also become commonplace to feature the concept in Welfare State Studies, especially in these ten years. Marshallian linear evolutionary view of citizenship is, however, of little help in the analysis of current social policy development in Europe any more. What we are witnessing in Europe is the transformation of the meaning of 'citizenship'. In concrete, this paper builds on Christian Joppke's hypothesis on the 'lightening of citizenship'. My initial hunch is that lightening of citizenship would have a substantial impact on internal aspects of citizenship, namely what a state expects from its citizenry and what it guarantees in return. Taking recent social policy developments in Europe as an example, this paper contends that lightening of citizenship entails universalisation and lightening of social policy. In other words, the lightening of citizenship coincides with the lightening of social security. The paper highlights the roles of the EU institutions in this transformation. Especially, this paper features the effect of the leading role of the judiciary in the EU and contends that the judiciary-induced policy making affects the content of the policy. Substantially, we argue that the universalisation and lightening of social security corresponds to functional requirement of the internal market in the first place, but it is also a plausible answer to the increasingly diversified and de-stylised life career of its citizenry. In this regard, 'lightening' should be conceptually separated from mere 'retrenchment' of welfare or 'neo-liberalization'. This direction has been augmented by the intervention of the ECJ, whose judgements has built on the Union Citizenship and enhanced individual social rights protection. This trend may be called 'rights revolution' European style, but not without price. Featuring citizenship as a universal status, individual rights are protected, but collective ordering of social relations, which has been an important part of the social rights, would take a back seat. Therefore, the paper contends that a new perspective of "the individual versus the collective" is relevant in the analysis of EU social and employment policy. "Housing in Retirement Across Countries"
The “retirement saving puzzle” is a phenomenon in which many households U.S. households have significant wealth late in life, contrary to the predictions of a simple life-cycle model. In this project, we examine cross-country differences in the saving behavior of retirees in order to weigh in on the discussion of the puzzle. First, we find that countries in our sample vary noticeably in terms of the extent of the puzzle: one group of countries, in South and Central Europe, look like the United States, while in Northern Europe, retirees spend down their wealth much more rapidly. Second, it appears that the rate of dissaving in retirement is correlated with the extent of public coverage of healthcare and long-term care, and these differences in saving happen predominantly through dissaving of financial assets, while housing assets are less affected. In a quantitative experiment using a life-cycle model of saving in retirement, we measure the role of out-of-pocket medical spending risk in accounting for differences in observed saving patterns among retirees in the United States and Sweden, considering housing and financial assets separately. The model predicts that this risk accounts, on average across age, for one-half of the difference in median net worth between United States and Sweden, and for about 70 percent of the difference in median financial assets. The role of risk diminishes with age, and is seen primarily in financial asset saving, while housing assets do not appear to respond to spending risk, suggesting that housing is not a precautionary asset. Read more! Can Benefits and Work Incentives Counseling be a Path to Future Economic Self-Sufficiency for SSI/SSDI Beneficiaries? How Do the Changing Labor Supply Behavior and Marriage Patterns of Women Affect Social Security Replacement Rates? How Do the Disabled Cope While Waiting for SSDI?